Circulation Booster To Reduce Swelling And Joint Pain. The REVITIVE IX is a medical device designed to increase leg circulation. 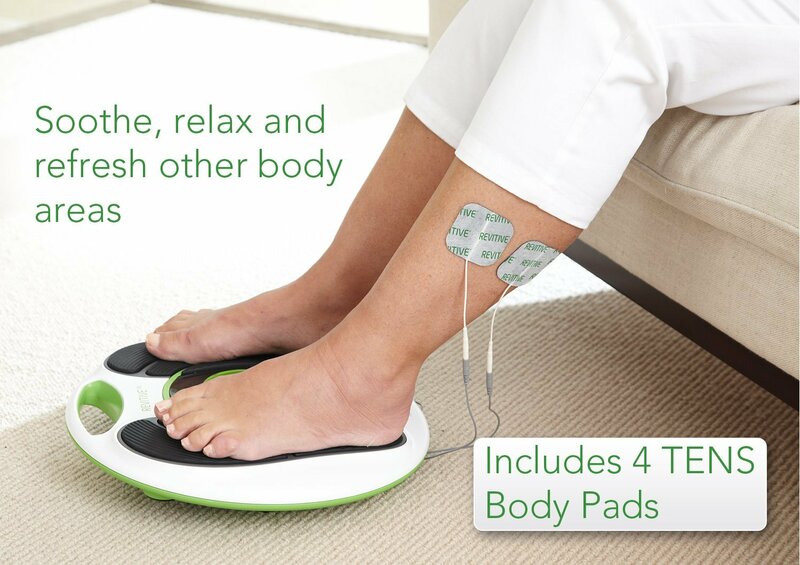 It uses Electrical Muscle Stimulation (EMS) to stimulate the muscles in your lower legs and feet to help counteract stasis and help maintain healthy legs. By placing your bare feet on each of the footpads, therapeutic electrical impulses stimulate the nerve endings on the soles of your feet. This causes the contraction and relaxation of muscles in the lower legs. This action is clinically tested & shown to increase circulation. Use REVITIVE IX daily and feel the difference in yourself. Blood flows around your body as part of the circulatory system. Our bodies were designed to be active and so when you walk your leg muscles actively contract and relax, to pump the blood up through the legs and back to the heart. Healthy leg circulation is where blood carries carbon dioxide and waste products pumped from your legs through your veins back to the heart and oxygenated blood is returned to the legs. Unfortunately, if you are unable to take regular exercise, the leg muscle pumps are less active and blood flow is reduced. This can cause blood and fluid to pool in the legs and may cause swelling and discomfort. 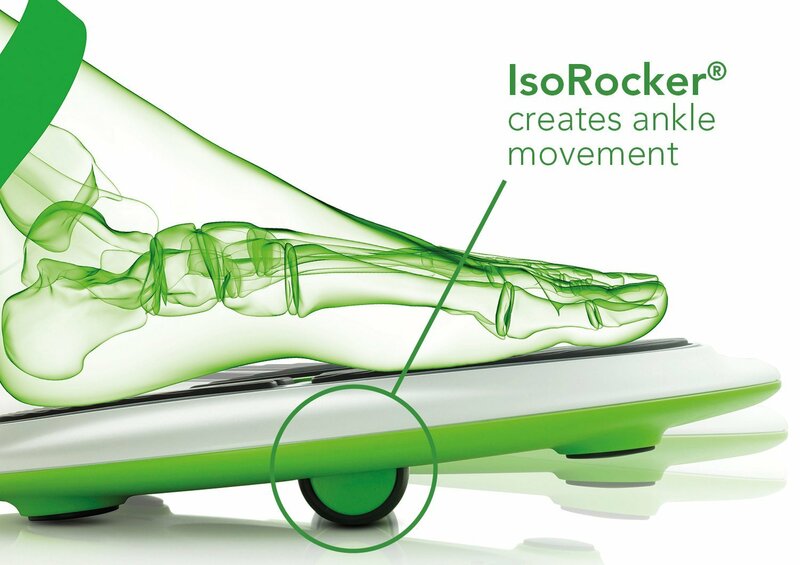 After placing both bare feet on the footpads of the REVITIVE IX Circulation Booster"!, increase the intensity level for the feet (levels 1-99) until you feel strong, comfortable, non-painful muscle contraction. This feels like a tingling, pins and needles sensation. 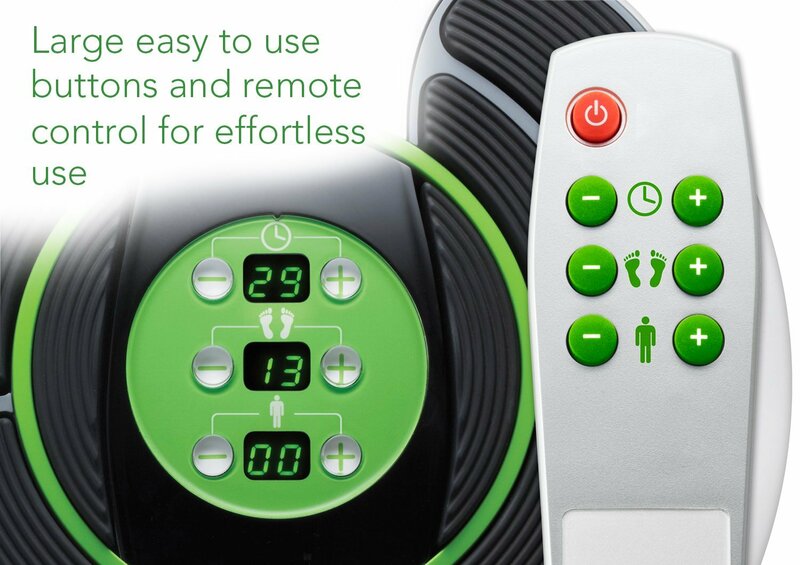 You can control the intensity and duration with the easy-to-use remote control. Just 20 to 30-minutes per day is recommended to experience the benefits. Unsuitable is you are fitted with a heart pacemaker or ACID, being treated for, or have the symptoms of an existing Deep Vein Thrombosis (DVT), or you are pregnant. Always read the label. Use only as directed. If you are uncertain about the cause of your symptoms or your symptoms persist, please consult your doctor. So, simply plug it into the mains, sit in a comfy chair, read a book or watch your favourite TV programme while you treat yourself to better circulation! 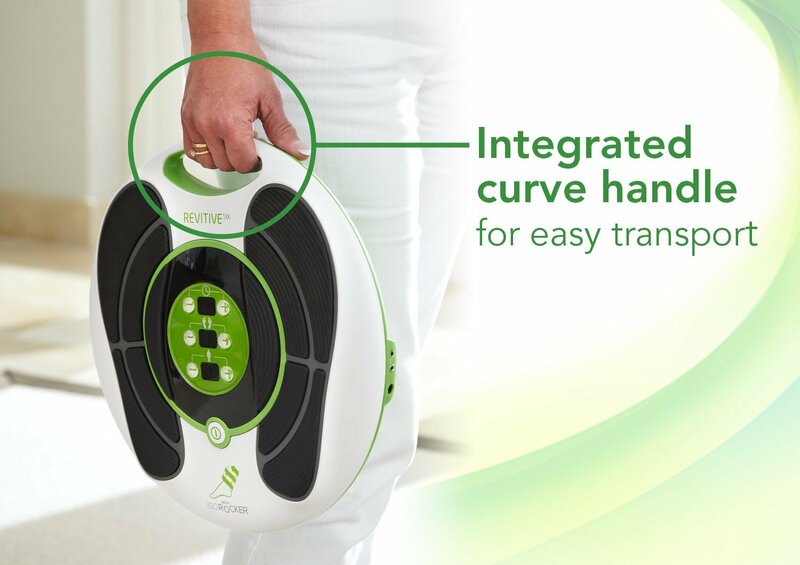 The Circulation Booster™ also includes four electrode pads which you can use to target points of pain such as your painful knees, aching back or tender elbow. Alternatively the pads can be applied to acupressure points. As the pulses cause the muscles to repeatedly contract and relax, the Circulation Booster’s electrode pads can also be used to strengthen specific muscle groups. To give greater freedom, REVITIVE Medic is rechargeable so doesn’t have to be plugged in. No more awkward cables or sitting in an uncomfortable chair, just to be near a plug socket. "We have tested and used the Circulation Booster and have found that it is very effective at stimulating the muscles of the calf and lower leg, causing a very good increase in blood flow. I am so impressed that I will be using it myself." - Mr Mark Whiteley, Consultant Vascular Surgeon and Director of the Whiteley Clinic. I purchased this for my Aunt as she has very limited mobility and suffers greatly with swelling in her feet, she has been using this daily for approx 30 mins and within a month the swelling has visibly reduced and she is suffering a lot less pain in her legs. I would highly recommend this product and it is worth every penny . Very quick delivery also and a very happy Aunt ! I use this daily and couldn\'t be without it . It really works for me ! very quick delivery also. This really works! I use it daily for my swollen feet and it is certainly improving the swelling. Quick delivery and I\'m very happy with the product.